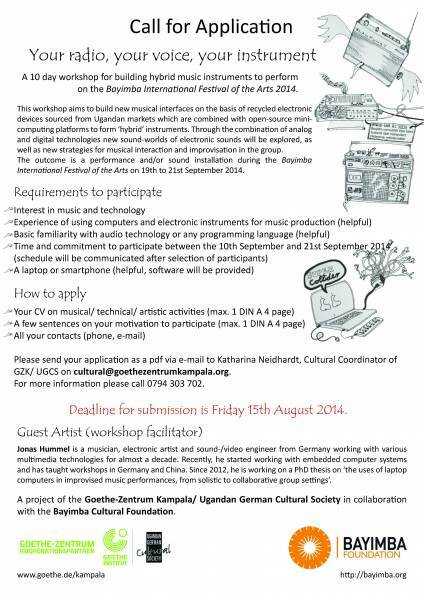 A 10 day workshop for building hybrid music instruments to perform on the Bayimba International Festival of the Arts 2014. This workshop aims to build new musical interfaces on the basis of recycled electronic devices sourced from Ugandan markets which are combined with open-source mini- computing platforms to form 'hybrid' instruments. Through the combination of analog and digital technologies new sound-worlds of electronic sounds will be explored, as well as new strategies for musical interaction and improvisation in the group. International Festival of the Arts on 19th to 21st September 2014. For more information please call 0794 303 702.
computers in improvised music performances, from solistic to collaborative group settings'. with the Bayimba Cultural Foundation.